When organizing a wedding party the focus always remains on the things that your guests will enjoy and appreciate. In a quest to impress, often we end up spending unnecessary amounts on things most invitees couldn't care less about. Don't believe us? Well you may just once you read up and realize how you can save actual money on little things that surely do not matter in the long run. Here are a few things you can avoid going overboard on. Okay so we see you yell with surprise on this one. After all isn't your wedding card the first impression your guests draw of the wedding that's gonna be? How can you ignore everything that you learnt about how important first impressions are? Well, let us explain why in the long run it may not matter if you chose the finest quality paper, the classiest font or a rare turquoise colour for your invitation cards. When guests receive card, they smile with appreciation over a aesthetically done card but often find themselves perplexed to see an over ornate card that basically in all practical sense screams just one thing - money gone down the drain. Instead choose a card that's simple, classy and something that will leave a sweet little impression rather than a beating your trumpet sort of an announcement of the gala show your wedding party is going to be. Remember, there is class in restrain - a lot of it. 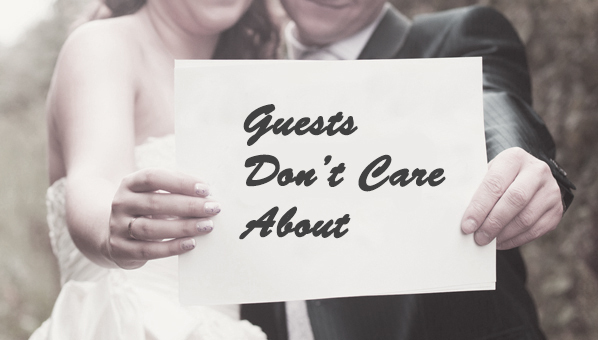 Orchids, lilies and expensive peonies are a treat for an eye but believe us your guests do not give a thought on why on earth you didn't ask your florist to pick fresh flowers from the local farmer's market. The entire task of flying wilting flowers from outside the town and desperately trying to keep them fresh by appointing a party to spray water on them is a totally unnecessary chore. It does not matter if the flower vase on the guest table had lilies or beautifully arranged gerberas. Just cut down the frills and concentrate on what really matters. Well unfortunately even in the times of mindful eating and health consciousness, salads at Indian wedding still remains one of the most wasted food items. Most guests either skip the salad corner in favour of deep fried, well-spiced snacks or pile up their plates only to later realize that they do not want to kill their appetite on it. Here's what to do – keep a small selection of salads that are tasty and complement the cuisine that you are serving. Instead of six varieties of Italian salads just keep two but do them well and serve them well. Your guests will hardly remember the number of asparagus and kale combinations that the chefs could toss in their salad plates during your wedding. What they will remember is a small selection that was delicious and healthy to the core. So save where you really can. Sept. 12, 2017, 5:45 a.m.